Game day. The Northeast is inundated with passing storms and severe weather. Tornado watches are issued through-out the area, with severe weather watches issued for Waltham. Off and on downpours strike the town repeatedly through-out the day. An EF0 tornado touches down in Greenwich and Stamford, CT.
NWS issues a tornado warning near Windsor Locks, CT. Off and on down pours continue for the Waltham area. 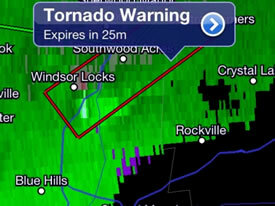 EF1 tornado with winds up to 90 MPH strikes Windsor Locks, CT. 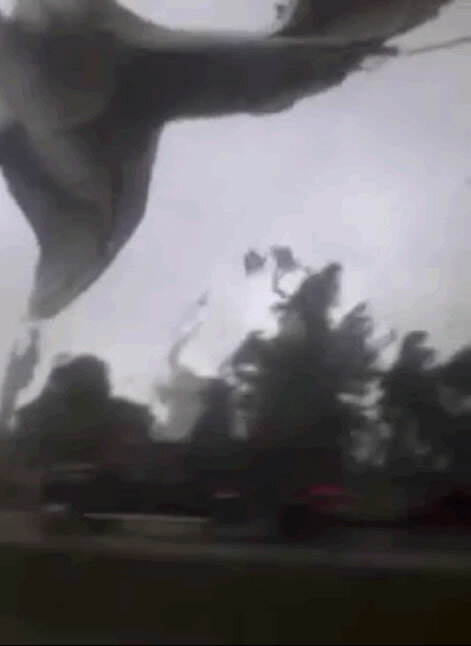 The dome of the “Sports Dome” is destroyed, with debris spread across a neighboring highway. (Photo) The storm system is moving in northeast trajectory towards the Boston area. NWS issues a tornado warning for Middlesex and surrounding counties, expiring at 3:15pm. Coaches for Softworld and Verdasys begin talking on whether the league has postponed tonight’s game. Tornado warning extended to 3:45pm. Email sent out to league asking if game has been postponed. Calls to league office are not answered. In light of the bad weather, the players for the Softworld team have made other plans for the evening. As a result, they will not have enough players for the game. They are working on the assumption that the game will be postponed and rescheduled. However, if the league does NOT reschedule the game, then they will accept blame and take a forfeit loss. Tornado warning extended to 4:30pm. Calls to league office are not answered. The Verdasys team captains tell their players that game will not be played. They also take a poll on whether to accept a forfeit by Softworld or to unofficially reschedule the game for a Friday afternoon. No tornados hit the area. Rain continues, however. No clear consensus is reached with the poll, arguing that Friday is a bad day for many. At least 8 players call in to get a vocal confirmation that there will be no game tonight. Team co-captain A-WOL leaves for Cusick Field to direct any players that might have gone. A light rain is falling, but is tapering off. A-WOL arrives at the complex and examines the field. Despite all the rain, the infield is in surprisingly good shape. Grounds work would be required on the infield to remove any standing water, and to rub-out slippery spots. On the neighboring Middlebrook Field, both the B&V and Milestones teams have shown-up for their game. A-WOL helps the two teams prep the infield for their game. Heather Lesson arrives at the complex, and would be the only other player from Verdasys to show-up. As for the rain, it stops. Radar confirms that there will not be any more rain for today. A-WOL asks the commissioner to make a decision about the game, and argues both sides of the discussion. On one hand, A-WOL mentions that the heavy rain and tornado warnings were reasonable reasons why one would assume the game would be postponed. On the other hand, A-WOL argues that league rules state that a game can only be postponed by the league, and if no such call is made by the league, then the game is assumed to be on. Softworld told Verdasys they would not have enough players for the game regardless, so one could argue they forfeited the game. A player from B&V mentions that the infield was fine during their game, but that the outfield was slippery.